Playing with Flour: Tri-color cookie cupcake bites! Let me take a small step back and talk about the cookies (pictured below, left) again. When I eat them, I marvel at how genius the marriage of rich almond cake with apricot preserve and bittersweet chocolate is (and I'm not a jam person). I used to enjoy the cookies occasionally from Italian bakeries where I could find them but hit the jackpot two Christmases ago when I learned how to make them. That's been one of the biggest success/highlight for me as far as discoveries thanks to this blog. They really are our family-favorite cookie, although the title "cookie" doesn't seem to do them justice. I think of them as petit fours, or small dessert cakes. Since that first time in December 2011, I've made at least six batches of the cookies. I'd do it more often but they are time consuming, taking as much as 12 hours to make, although much of it is wait-time, waiting for the layers to chill in the refrigerator. My husband requested tri-color cookies for his birthday a few months ago in November (come to think of it, he also asked for them for Father's Day), then I made another batch for us to savor over Christmas. As we were finishing the latest batch, we were already hankering for more but as much as I love them, I was thinking "again?...it's a lot of work!" So I started thinking about a way to shorten the time involved and wondered if I could turn them into cupcakes so I could skip some of the steps. ﻿As with any cupcakes, these do involve a bit of fuss. I baked the batter in mini cupcake tins, then carved out a little hallow inside each to pipe strained apricot preserve into so that there's a good amount of it in each cupcake. Finally, I topped each generously with a cap of bittersweet chocolate - not ganache or chocolate frosting but straight up dark chocolate as it should be. I found that using cupcake liners helps the mini cakes bake up more evenly and makes the job of adding the chocolate topping quicker and easier versus not using them. Now here's what you don't need to do when making these cupcakes instead of the cookies: You do not need 3 pans or to bake 3 batches/layers. You do not need to chill anything for at least 8 hours. You skip the layering, flipping, trimming, and coating of both sides with chocolate. Plus, you don't have to worry about slicing them and doing so without cracking the chocolate. 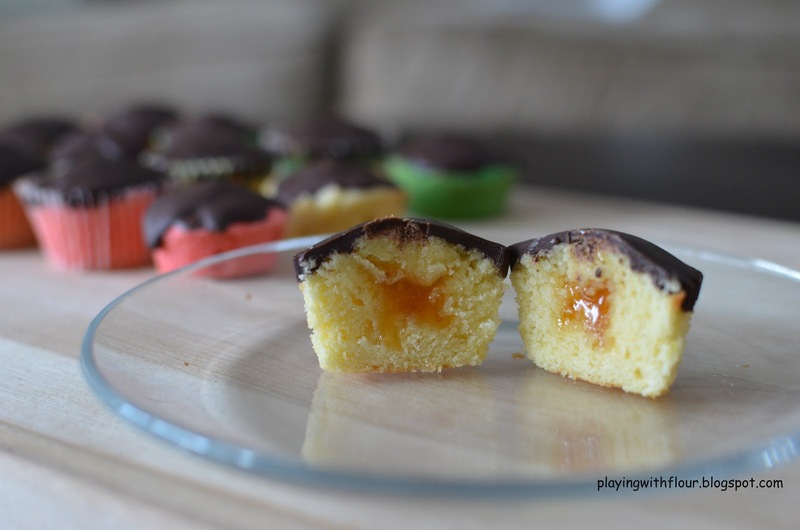 These mini cupcakes are a big time saver, the major benefit being you don't need much advance planning and can eat them same day, within a couple of hours. If you really want to cut the time and work down further, eliminate the food coloring altogether so that there's no extra separating and mixing; just bake plain, yellow color cupcakes. The flavor will obviously be the same. I made the colors here to drive home the point of what they are but next time around, I'd like to skip the food coloring (little guy seriously protesting this intention though). Now on the crucial question of taste, these are very similar to the tri-color cookies, particularly when you take a big bite and get that combination of flavors in your mouth. In other words, they are yummy!! But of course, tri-color cookies are still "king" because of their more uniform layers (all seven of them!) and flavors of chocolate-almond cake-apricot preserve. The cupcakes tend to be a tad bit dryer around the exposed sides whereas you get to trim away the dry edges of the cake before cutting them into cookies. But baking and storing the cupcakes in paper liners largely solves that problem. All in all, this little experiment worked out really well and I'm very happy I gave it a go. My family and I all loved it and I'll be making these when the need for a little tri-color cookie "fix" arises but I don't want to spend 12 hours on it. This is a great alternative if you want to reserve the cookie project for the holidays or special occasions and make these during other times. I know many people share our love of Italian tri-color or rainbow cookies (thank you to the Italian-American immigrants who created it to honor their country and flag). I hope anyone who enjoys the cookies and decides to give that recipe or this cupcake version a try find it worth their time and effort, like I do. Or I hope there's a good Italian bakery near you where you can get these delectable treats. 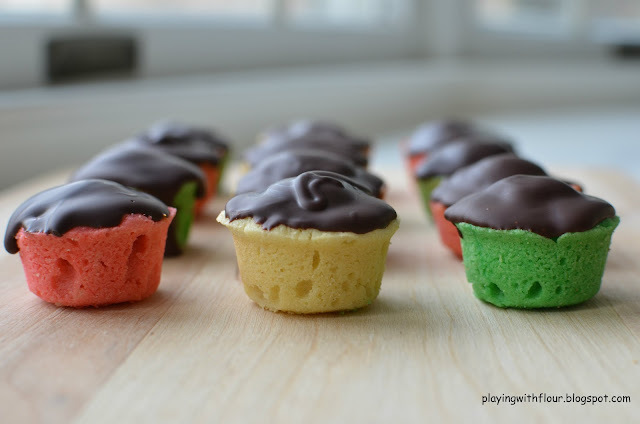 Making the batter: The recipe for these Italian tri-color cookie cupcake bites is essentially the same as the cookies as far as the cake batter is concerned. You can see all the pictures and descriptions on how the batter is whipped up in my original post. For these cupcakes, I've divided the recipe in half, which should make about 33 mini cupcakes. Baking the cupcakes: So I'll pick up on this where the batter is done and ready to be filled into the mini muffin cups. I tried baking them using cupcake liners and without. I knew liners would make the job easier but I thought cupcakes without liners might look nicer so we can see the colors and have a clean edge. I like to use a small ice cream scoop to fill the cups but without it, use two small spoons to edge the batter out into the slots. It's hard to tell but I also baked some of the cupcakes in a little pan I have that makes bite size treats a tad smaller than the mini cupcakes. So use what you have but keep an eye out on the bake time. As for bake time, 9 minutes seemed to be the right number for me (though my oven's been acting up again) and I'd say 8-10 minutes as the general guideline but make sure to check on them early and pull them out when a cake tester or toothpick inserted inside comes out clean. Like the cookies, you don't want to overbake them. Remove the cupcakes from the tin when they come out of the oven and let them cool on a wire rack. Applying the apricot filling: I originally hoped that I'd be able to simply pipe the apricot preserve straight into the cupcakes without cutting them. I tried that and it just didn't work well since the almond cake is pretty dense (albeit moist) and I don't have a special filling piping tip. To get enough filling in the cupcake (and that's important), take a small sharp knife and cut a little round or hallow in the cupcake going down about halfway or so at an angle so that it'll pop out. Remove that little top you cut out and fill the hole with the preserve. I put the strained and cooled preserve into a piping bag with a small tip but you can simply cut a small opening in your piping bag or sandwich bag. After filling the cavity you made, cut away a bit of that pointy end of the cone-shape top you sliced off before plopping the top back onto the cupcake. This is the part that takes a bit of time and fuss work but it's worth it. Adding the final chocolate coating: Last step, spoon a good layer of bittersweet chocolate on the mini cupcakes. A demitasse spoon (smaller than a teaspoon) works best. It will be very easy to generously coat the tops with chocolate if you are using cupcake liners (no worrying about chocolate oozing down). I use Scharffen-Berger 70% bittersweet chocolate for these cupcakes, same as I do for the cookies. I think it is simply delicious here! And applying the chocolate, rather than using chocolate ganache or some kind of soft chocolate frosting, gives it that authentic tri-color cookie texture. I love how the chocolate cracks under your teeth and blends with the moist, chewy cake and slightly tart filling. 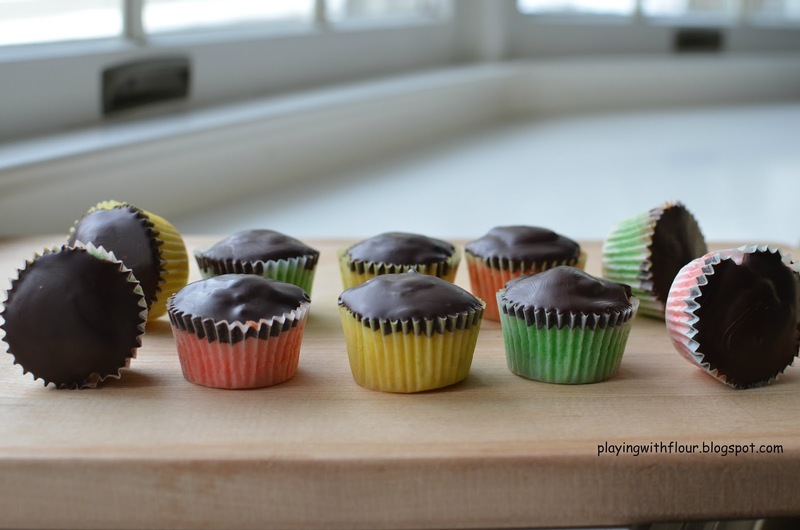 Pop the little cupcakes into the fridge just until the chocolate sets and they're ready to go. I store them in an airtight container, in the refrigerator, just like I do the cookies. Simply bring them to room temperature before serving. Adapted from this recipe...I turned them into mini cupcakes! * To further save time and skip a couple of steps, you could consider eliminating the food coloring and baking all the cupcakes in their natural yellow hue. Beat egg whites in mixer fitted with the whisk attachment at medium-high until they just hold stiff peaks. Slowing add 2 tablespoons of the sugar, whisking on high until slightly glossy and stiff. Transfer to another bowl (unless you have an extra mixer bowl). bout 2 minutes. Add yolks and almond extract, beating until combined. Gradually add flour and salt until just combined. Fold half of the whites into the mixture to lighten, then gently fold in the remaining whites thoroughly. Divide the batter as equally as possible into 3 bowls. Stir green food coloring into one and red into another, leaving the third plain so that you now have 3 different color batters to bake from. Using a small ice cream scoop or two spoons, fill cupcake liners about 3/4 full. Bake for approximately 8-10 minutes but check early to avoid over-baking. They may look barely done but are when a tester comes out clean. Remove cupcakes from the tin right out of the oven and let cool on a wire rack. Place the strained and cooled apricot preserve into a piping bag fitted with a small tip or simply use a sandwich bag, snipping a very small opening at one corner. With a small, sharp knife, cut into the cupcake about halfway between the center and edge of the cupcake at an angle and going down about halfway or so. Cut out a circle and you should end up with a cone shape top. Fill the hallow with preserve. Slice away the pointy end of the cut away cone top before fitting it back onto the cupcake. Repeat with all cupcakes. Melt chocolate in a heatproof bowl set on top of a pan of simmering water (or carefully in the microwave, in short intervals and stirring often). Using a demitasse spoon (or small teaspoon), quickly spoon some melted chocolate over each cupcake. Place cupcakes in the refrigerator until chocolate sets. You can store the cupcakes in the fridge, in an airtight container, for several days. Bring them to room temperature before eating. I know what you mean. For me, I thought many of the cookies just tasted the same at some of the Italian bakeries (but there are some really good ones). But if you or your family like those rainbow/tri-color cookies, you have to make them at home! Make sure you try and know you love them first though because it is a bit of a labor of love. We seriously looove them!